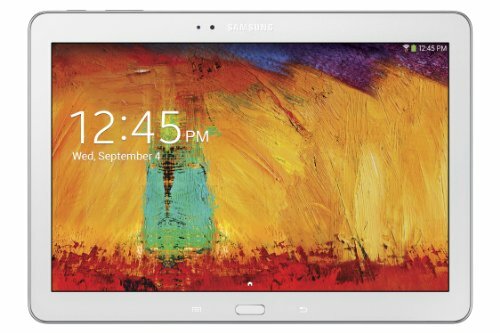 The Samsung Galaxy Note 10.1 (2014) Edition tablet is equipped with a variety of user-friendly features. The ultra-thin and lightweight model features S Pen and S Pen technology and boasts the Android 4.3 Jelly Bean operating system. Striking WQXGA 10.1” TFT LCD multi-touch screen display enables you to enjoy videos at a 2560 x 1600 resolution. You can easily edit photographs and take notes with the help of built-in S Pen, as well sa share handwritten notes and remarks from your existing location with the help of Wi-Fi Network. At 9.6 x 6.8 x 0.3 inches and a scant 1.2 lbs, the tablet is lightweight and easily stored in a backpack or purse. Prominent features include stereo speakers, microphone connectivity, MicroSD card slot and 8MP camera, 3.55mm Earphone Jack and USB connectivity support with optional adapter. 1.6 Conclusion and Why to Buy It? Samsung Note 10.1 is an excellent choice for both reading e-books and watching movies. The 10 inch screen with 2560 x 1600 resolution and Dolby Virtual 5.1 surround sound enhances your entertainment options. The S Pen increases the functionality of the tablet, allowing easy access to shortcuts and the ability to translate your handwritten notes. Beautiful Screen in 2560 x 1600 resolution and more than 4 million pixels. Excellent speed and functionality with a 1.9 GHz quad core processor and android 4.3, Jelly Bean. Capture crispy images and record videos with an auto focus rear camera of 8 MP and front facing camera of 2 MP. Enjoy music, videos and games with Dolby Virtual 5.1 surrounded sound. You can make handwritten notes and easily access different features with the help of S Pen. With 9 hours of active battery life, you can manage both work and play together. 4 million pixels of the typical HDTV screen in your palm provide bright colors, vivid text and clear graphics. Pixel density is 299 pixels per inch (PPI). The tablet delivers brilliant images and the 16:10 aspect ratio enables you to record high definition videos. The Galaxy Note 10 is equipped with Samsung’s S Pen, for writing handwritten notes, phone numbers, contact information and search terms. Handwriting-to-text engine feature helps you to automatically convert your written notes to digital type data. Galaxy Note 10.1 2014 is On Sale at Amazon. Samsung Multi Window feature enables you to open two applications at once and make it easy to drag the contents of one window to another window. Samsung Note 10 allows you to write two email messages at once by opening two websites side by side. • The Galaxy Note is 12% thinner, 4% taller and 3% wider than the iPad Air. • The Note has a dimpled faux leather finish that resembles the Galaxy S5 chassis, while the iPad Air has an aluminum unibody construction. • The Galaxy features excellent resolution, because of its latest technology predecessor, meaning that the resolution is sharper than iPad Air. • The Note Tablet features a swipe-based fingerprint scanner. • Note has a “exclusive” pen that Air lacks. Q: What is the warranty status of the Samsung Galaxy? The Samsung Note 10.1 comes with a one year warranty. Q: My battery is not working–is it covered under the warranty? Yes, the battery is covered for as long as your device is under. Q: Does my Samsung galaxy accept voice commands? Yes, the Galaxy Note features voice command capabilities. Q: Where can I find discount options for the purchase of the Galaxy Note 10.1 ? Follow this link for discounts options on the Note Tablet 10.1 during certain times of the year. Conclusion and Why to Buy It? Galaxy Note 10.1 features excellent color representation and clarity as well as a stylus that works like a pen; allowing the user to write handwritten notes. It is perfect for both office and personal use, featuring data storage and beautiful, clear, crisp sound with Dolby Virtual 5.1 surround sound. Users will enjoy professional photography results with the help of the internal 8 MP camera, as well as download and install PDFs, PPTs, DOCs and XLXS supported programs.